The Sofala Bank shrimps are the main component of Mozambican export fisheries, which contribute to 55 million USD to the GDP of the country. A good understanding of its spatio-temporal dynamics is required to ensure a sustainable exploitation of this resource. Recently, under continued low recruitment, a combination of detrimental environmental factors and overfishing has been suggested as the cause of poor recruitment, which is a major concern. An individual-based model coupled to a ROMS circulation model was used to investigate the influence of environmental processes on transport and shelf retention of simulated larvae of banana shrimp on the Sofala Bank. Results of 5-year simulations indicate that most larvae (at times > 95%) were retained on the shelf. No seasonal cycle was apparent, but occasionally events of decreased shelf retention (loss) were observed. Lost larvae were transported offshore or to the south by the complex mesoscale eddy field. 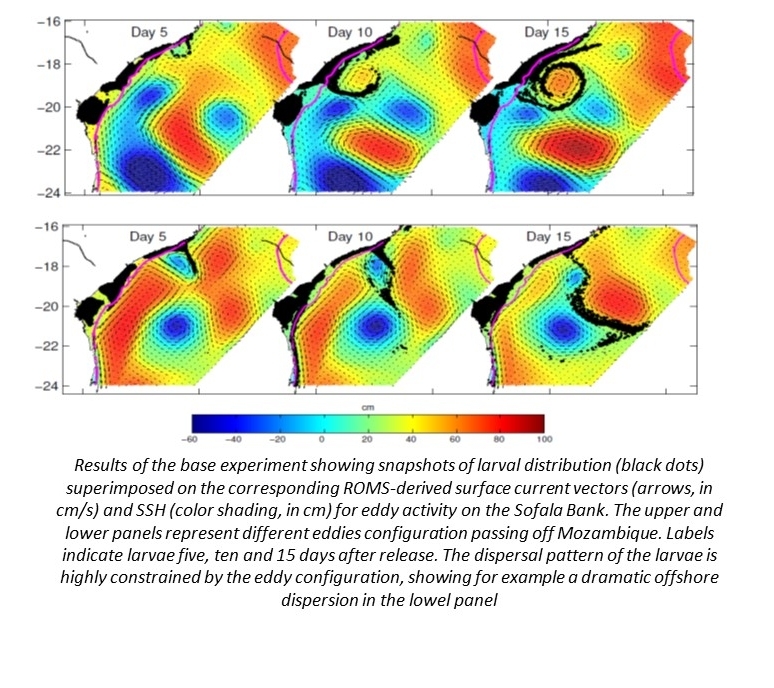 An anticyclonic eddy SOM pattern was correlated with low larval retention at lags of 5-12 days. In contrast, eddies also promoted larval shelf retention, depending on their variability. High retention was correlated with cyclonic/anticyclonic eddy dipoles, with a strong shoreward current, at lags of 7-15 days. Most larvae retained on the shelf traveled ~100 km. In another configuration, the larvae were lost far offshore or to the south, and traveled longer distances, up to 1600 km in 15 days, with a small peak in the distribution at ~650 km. For the inshore sites, there was no difference in shelf retention for larvae released in the areas where spawning occurs or not. Similarly, there was no difference in shelf retention for simulated larvae released inshore or offshore to the south of ~19-15°S. To the north of ~19°15’S, shelf retention was significantly higher for the inshore than for the offshore release areas. Central and northern areas contributed little to the simulated shelf retention, yet promoted dispersal because they are more exposed to the offshore eddies. Simulated larval shelf retention was consistently higher off Beira Bay, which is protected from the eddies. Simulated larval retention was sensitive to assumed low lethal temperatures, with potentially massive larval mortality in winter months. Cool (cyclonic) eddies also appeared to affect larval survival at times, even during summer.